American hero Louis Zamperini shares his wisdom, values, lessons, secrets, and other insights gleaned from his remarkable experiences in this powerful and inspiring book.Louis Zamperini’s struggle to survive the unimaginable—brought to life in his autobiography Devil at My Heels and in Laura Hillenbrand’s #1 New York Times bestseller and its film adaptation, Unbroken—elevated him to his rightful place among our country’s greatest heroes. 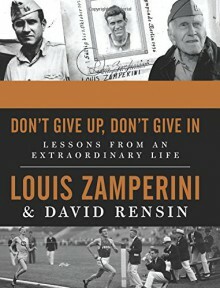 Now, Zamperini reveals the wisdom he learned along his incredible journey.Faced with one misfortune after another—a plane crash, the shark-filled waters of the Pacific, a brutal Japanese prisoner of war camp—Zamperini could have given up a thousand times. Instead, he chose to see every hardship as a challenge that he was determined to overcome. Enduring the perils of World War II, Zamperini continued to find adventure at every turn—from crashing weddings to facing down Frank Sinatra in a fight to getting mixed up in a bank robbery. Until his death at 97 he remained undaunted; happy, sharp-minded, and healthy, and continued to engage life to its fullest.In Don’t Give Up, Don’t Give In, he offers never-before told tales that embody his simple, yet essential secrets of success: how his relationship with God, his ever-positive attitude, his constant pursuit of accomplishment—and a healthy dose of mischief—have helped him lead a long and fulfilled life, lessons we can all use to transform our own.